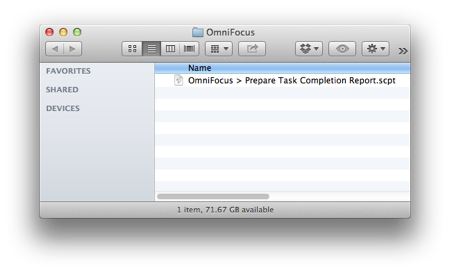 I've mentioned before that OmniFocus is my task manager of choice. Each morning, I pull up a list of scheduled tasks for the day, and focus on getting them done. 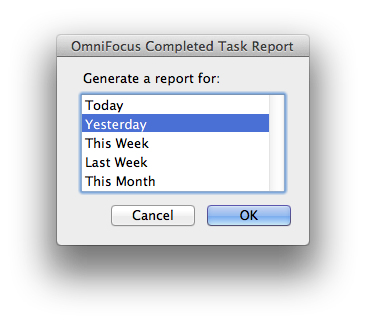 In OmniFocus, I've set up Perspectives (saved window states) for both Due tasks and Completed tasks. What I really want, however, is something that will pull out recently completed tasks and summarize them in Evernote, my note management app of choice. This way, I can maintain a historical log of my progress, and pull out summaries of completed tasks to send to clients. Since this type of integration isn't built into OmniFocus or Evernote, I wrote an AppleScript to do it. NOTE: If you have any trouble following along, you can download my completed script here. 2. 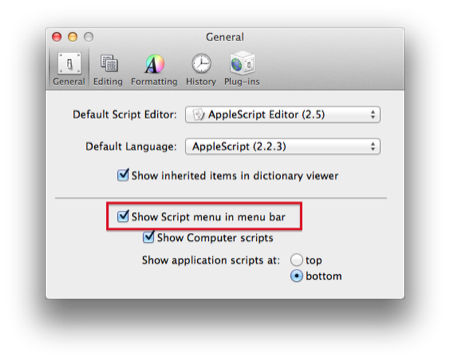 If your system-wide script menu isn't enabled already, go into AppleScript Editor's preferences window and turn it on. 5. Go back to AppleScript Editor and save the script as OmniFocus > Prepare Task Completion Report into the ~/Library/Scripts/Applications/OmniFocus folder you opened in the last step. Bring OmniFocus to the front. 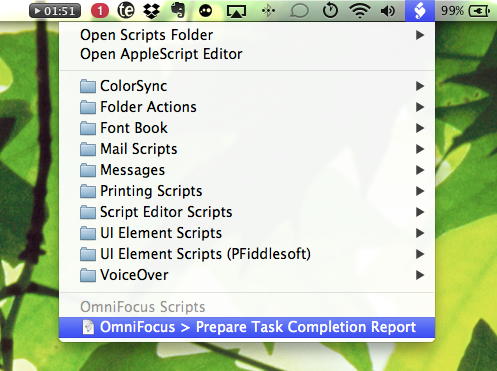 Next, select OmniFocus > Prepare Task Completion Report from the script menu. The script starts by asking for the scope of the report. Your options are to summarize tasks from today, yesterday, this week, last week or this month. Choose one, and click OK.
Next, the script retrieves a list of tasks within the specified timeframe, formats them as HTML, brings Evernote to the front, and creates a new note. 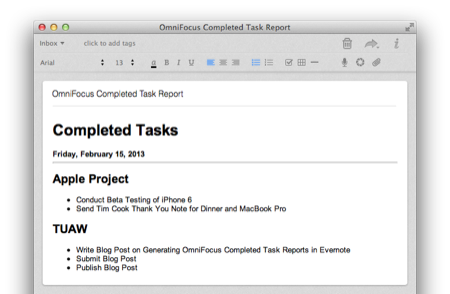 You've now got a summary of recently completed tasks in Evernote. Do you feel productive yet? Until next time, happy scripting!